Get the most of the great outdoors with your family or on your (most extreme) own. 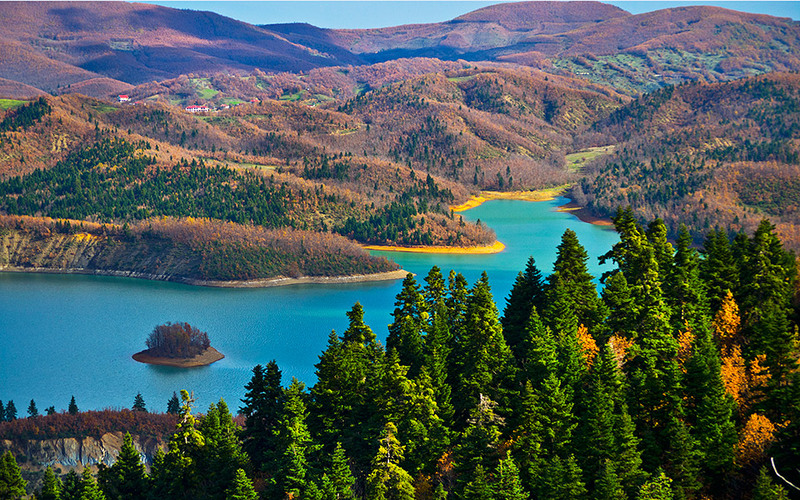 Located just half an hour from Karditsa, Lake Plastira is a destination that attracts visitors all year round. Many come here for the peaceful vibe of the area and its natural beauty. But if you prefer your vacation to be a bit more action-packed, there is plenty to satisfy those who like combining a holiday with staying active. Canoeing on the lake is a great way to explore it and its size means you are free to set your own pace. Choose your method of transportation depending on what you’re after. There’s the competition-style craft with two paddles that zips across the lake. Popular with families for its stability, the single-paddle, Canadian-style pirogue holds up to three people. Watercraft are available to rent by the hour, or you can take part in the organized three-hour tour that includes a stop at the islet near Neochori or on Lamberos beach. When the lake is at its deepest in the late winter and in spring, the best route is that which leads to the mouth of the Megdovas river, where you can paddle among beautiful willows, poplars and head upstream if you wish. Hydrocycle, a fun activity which is available all year round. A more unusual way to enjoy the sights of the lake is via a hydrocycle, a fun activity which is available all year round. The Tavropos Activity Centre offers these unusual water bikes for rent from 30 minutes onwards. The bikes are suitable for all ages and require no special skills. 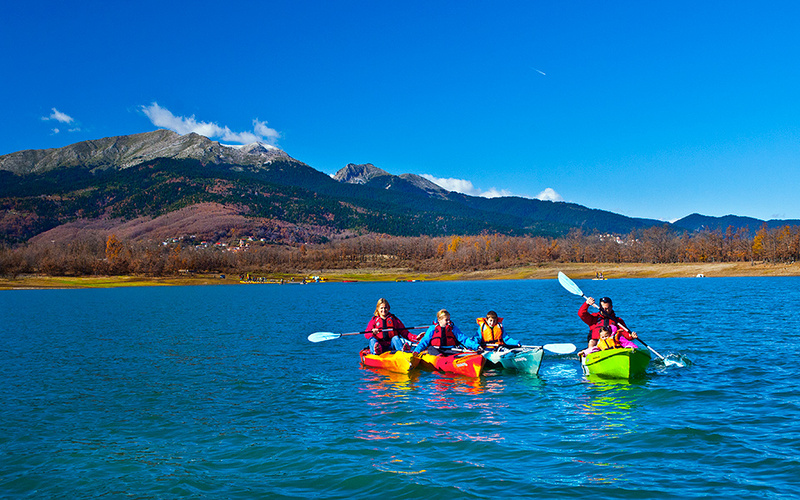 Plastira is a great lake to try this activity, since its still and placid waters mean it’s unlikely you’ll fall off our bike. All of the hydrocycles are equipped with a waterproof pocket for keeping personal items safe and dry, and several have baby seats so that the entire family can enjoy the ride. Guided hydrocycle tours are on offer; they start from Kalyvia, near Pezoula. The short version lasts three hours and includes a snack break at the islet off Neochori, while the day tour takes you all the way to the lacework of fjords on the opposite shore, nearly as far as the dam. Back on dry land, try your hand at archery. Back on dry land, try your hand at archery. 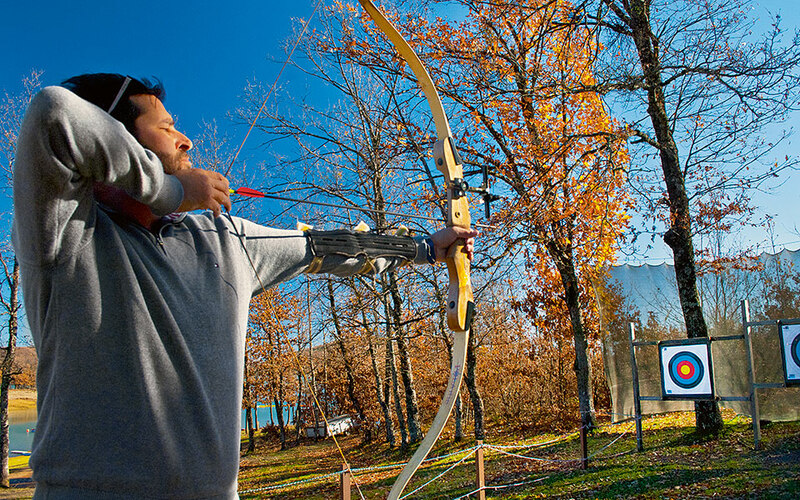 The targets are set out in the woods around the lake, meaning that apart from an archery experience, you’ll also get to imagine yourself as William Tell or Robin Hood as you take aim flanked by the tall trees. A steady hand is the most important tool for this activity, making it suitable for all the family. Each session includes 10 shots and the adult bows provided by the company are similar to Olympic quality bows. Children get to try their hand with special bows designed for ages eight and above. If you want to combine an adrenaline rush with exploring Plastira, mountain biking is the thing to do. 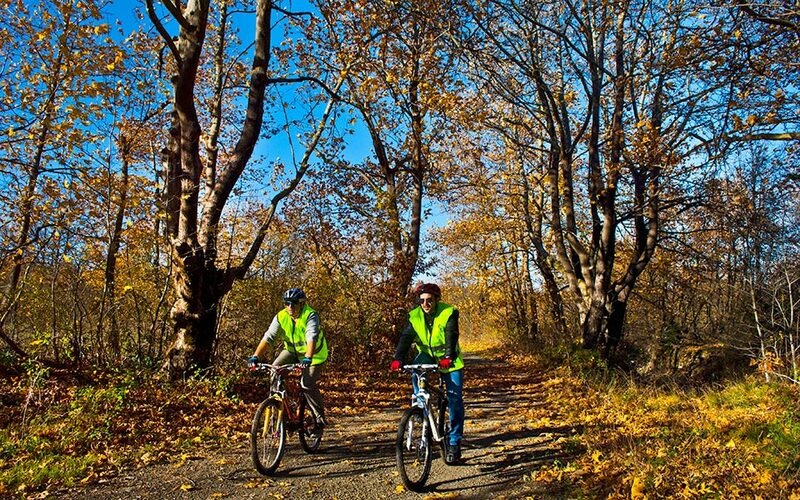 The main off-road bike route runs along the shore; it starts at a base camp at Kalyvia, near Pezoula, and ends at the botanical garden near Neochori. The route there and back is 8km but you can opt to continue further if there’s no snow. 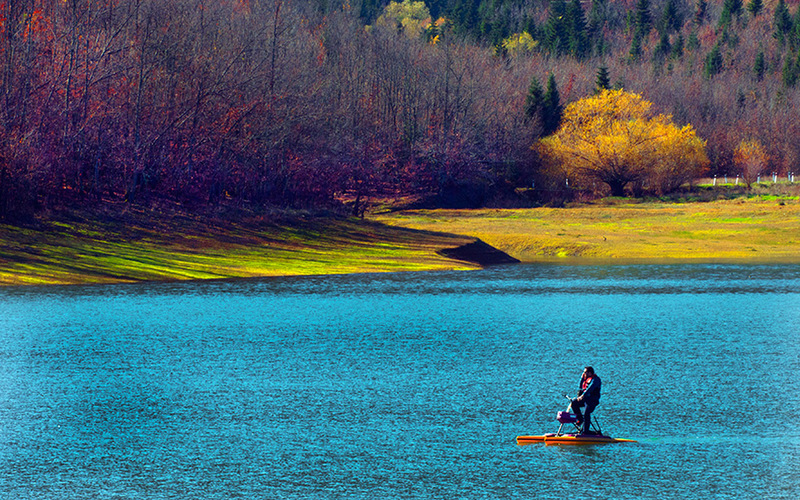 The best time to ride around the lake is in the summer or autumn, when the water level is at its lowest. An all-day guided door is recommended if you want to try this 75km route. If you have your own bikes, the team will be glad to point the route out to you. The same route can also be explored on foot, though only for experienced hikers as it’s a long walk. Mountain biking is also available for children over 12. Become one with nature and take a hike through dense forest of firs and oaks that offers glimpses of the lake, ravines and caves. Hiking in Plastira is a pleasure thanks to an extensive network of well-signposted trails. 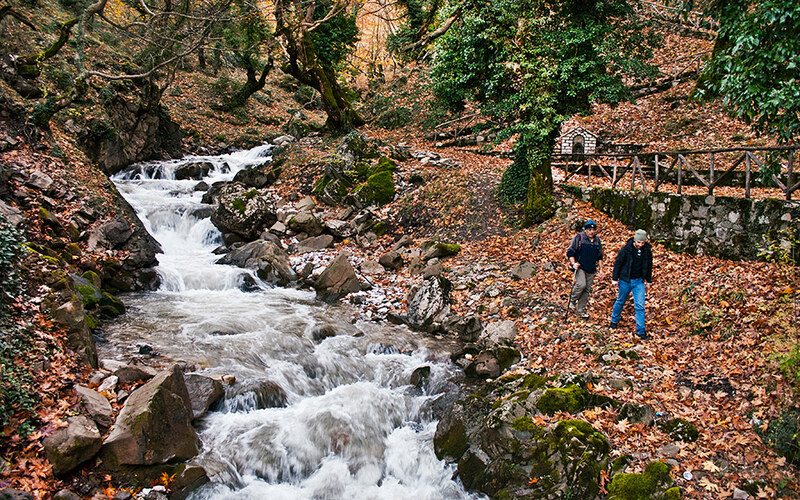 One of the most popular routes starts at the flour mill in Anthochori and leads through a poplar-covered ravine to two waterfalls. It takes about an hour to make it all way to the second, higher waterfall (some 12m in height), about 1.5km from the starting point. The second trail is a two-hour round trip and offers constant views of the lake as it winds through the fir forest, ending at the observatory. The trail to Gakis’s Cave, which starts just past the fish farm, is also very interesting. The cave itself is nothing special, but the trail up to it leads through the gorgeous Keredan gorge. The route there and back takes about three hours and a guide is recommended, since it’s not signposted. 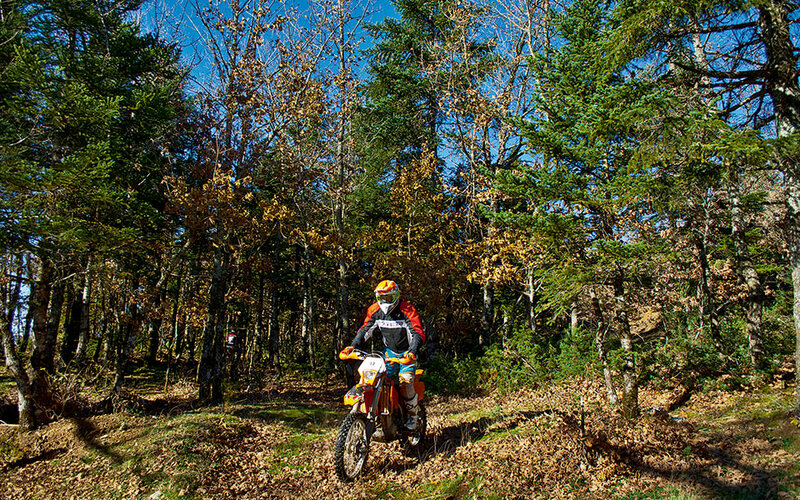 The most popular destination for motorsport enthusiasts is Agrafa, with trails that cross trails, streams and beautiful forests. 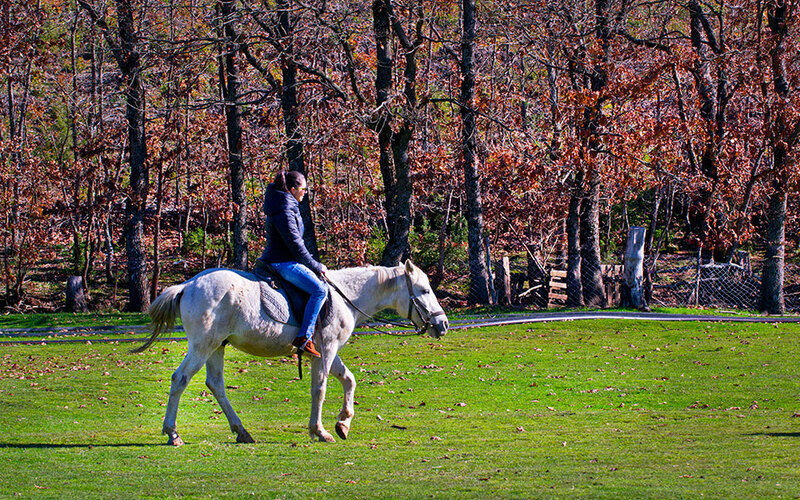 For all of the activities (apart from the motorsports and horse riding), get in touch with Tavropos, tel. (+30) 24410.925.52 and (+30) 697.774.0066. At Saloon-Farma Zambetas, tel. (+30) 24410.928.55 and (+30) 694.559.3807, you can try archery and hydrocycling as well as horse riding.